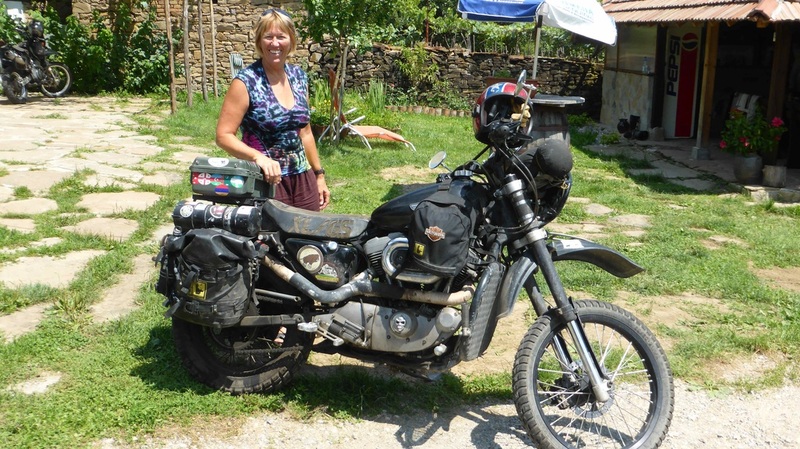 We rode up to Thessaloniki, then managed to take a wrong turn and got stuck on a motorway, which became a toll road, taking us in the wrong direction, and there was no way to get off it! After paying a toll to nowhere, nearly running out of fuel because there were no servo's, and then getting caught in a bad thunderstorm, I decided Greece didn't want us to leave. Tempers flared, and it was time to dry out and have a cup of tea while the thunder and lightning passed. Having wasted two hours, we continued on the correct road to the border. From there the road deteriorated and we were kept alert dodging potholes and lots of horse drawn carts until we reached Petrich, where we found a nice room for the night, with lock up storage for the bikes. Price was 20 Euro's, so fitted the budget. The people at the hotel recommended a restaurant nearby, where we had a huge tasty meal and a bottle of wine, total of 12 euro, Bulgaria was looking good! While sitting eating our breakfast next to the bikes, I saw a small quad bike riding down the road. No lights, no number plate, old guy riding it had no helmet, and the muffler was falling off, so you couldn't miss it. No one even looked at him, this is normal here! Petrol was 1.19 euro a litre, about 35 euro cents cheaper than Greece. From Petrich we headed north to Sofia (where it was raining), along mostly good roads, then east to Motocamp Bulgaria, where the HU meeting was being held. Great time at the meeting, and at Motocamp, which became known as Hotel California, because it was so hard to leave! Polly, Ivaylo, and Doug really are great hosts. We met up with some old friends there, and made a heap of new ones as well. Graham Field and Sjaarc Lucassen were there, and we met up with Shane Smith (rtw shane), who we had been talking to for about 12 months on Facebook. 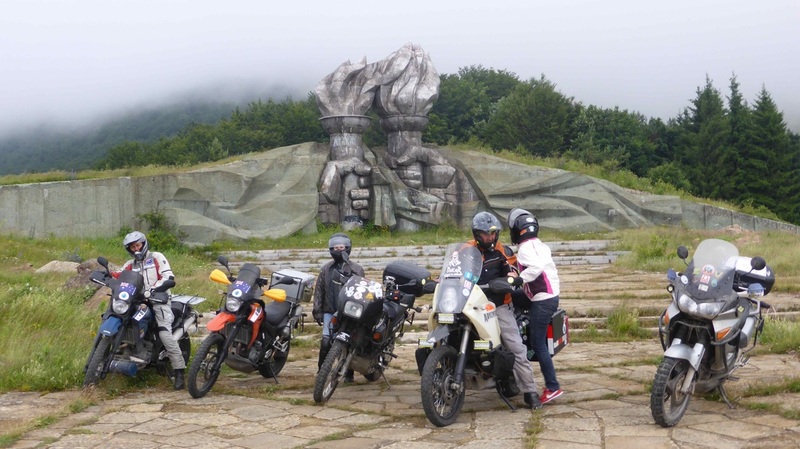 There was a ride from Motocamp to Buzludzha, the former communist party headquarters building that looks like a UFO, which is well worth seeing. The weather at the top of the mountain was windy and cold, but OK further down. 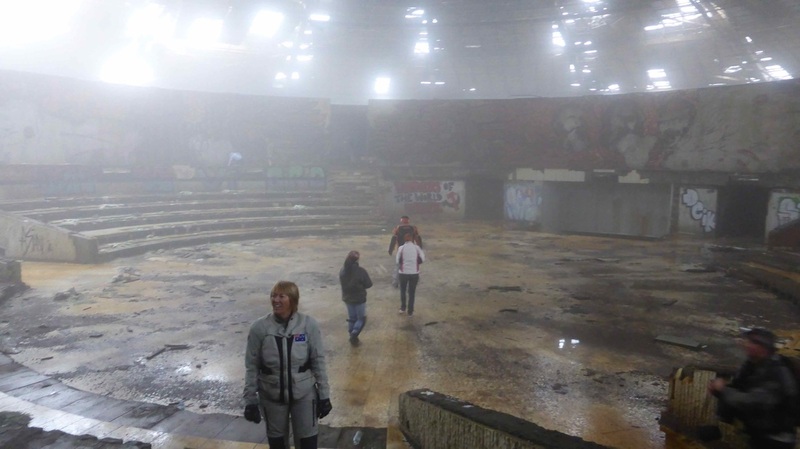 Lyn inside the Buzludzha monument, lots of holes in the roof now. The torches at the base of Buzludzha, which is hidden in the cloud behind us. With Sjaarc Lucassen, that R1 and he have been just about everywhere. When is a Harley not a Harley? When it is Doug's Sportster/KTM/other. Very capable offroad. We had a ball at Motocamp, relaxed, fitted new tyres to the bikes, serviced them, and resealed Lyn's forks, which had been weeping for a while. We rode into Veliko Tarnovo, (VT), the old capital of Bulgaria, really pretty city. It was warm riding, temperatures had been getting up to 42 degrees C. Another aussie turned up on a bike, Terry, from Coolum, just up the road from us in Queensland, it really is a small world. We finally left Motocamp, heading for Turkey, the weather was a bit cooler today. The plan was to head east to the Black Sea, then go down the coast. As we headed further east, the country got flatter, and we copped really strong crosswinds, which made riding difficult for a while. 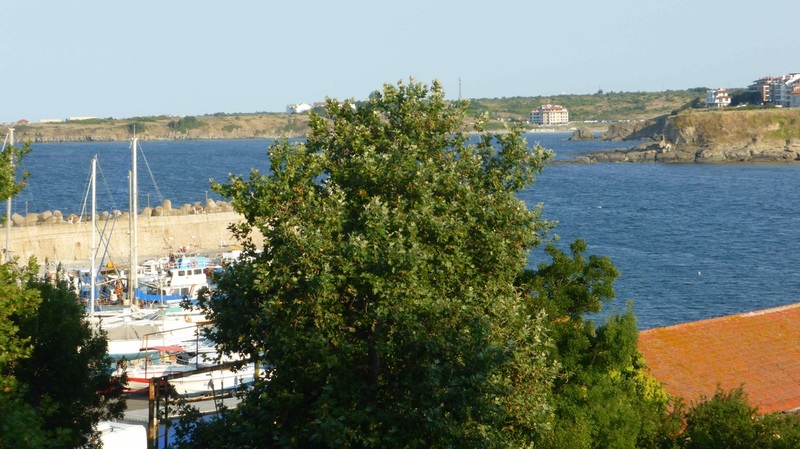 We hit Burgas on the coast, then found a room in Ravda, just to the north. It is a beachside touristy town, but the room was nice, and only 13 euros, so we stayed two nights. We needed a charger adapter for Lyn's computer, and I needed a tyre pressure gauge, and Burgas was big enough to do some shopping in. 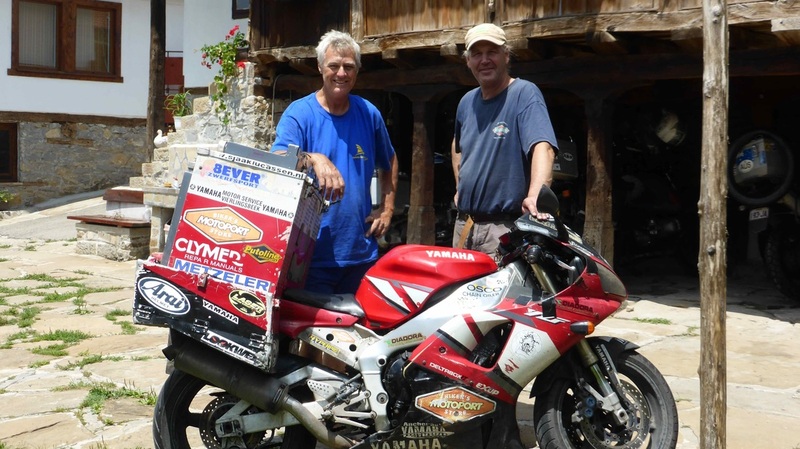 Following good road down to Marko Tarnovo, we approached the Turkey border. Fuel is cheaper in Bulgaria, so we filled the tanks, and got rid of our Bulgarian Lev. 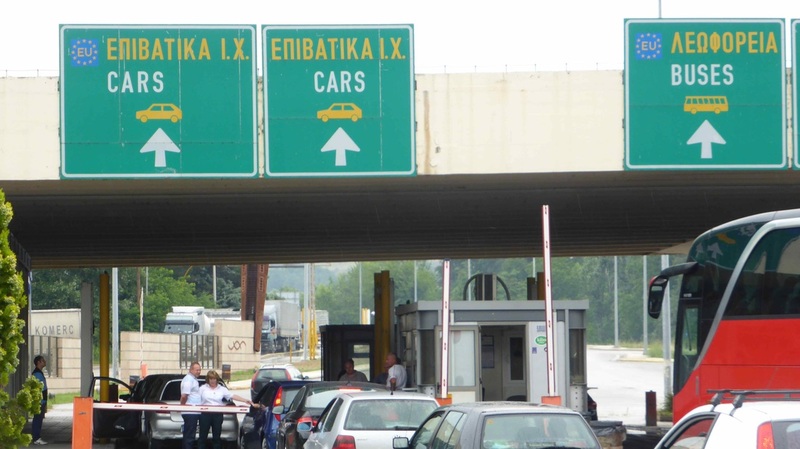 Arriving at the border, we found we didn't have enough cash for the insurance and visas, and as there was no ATM there, we had to cross back into Bulgaria, (which we had just cleared), and head back the 12 kms to town for enough cash to get across the border. Not wanting to take excess into Turkey, where they don't accept it, we got the right amount from the ATM. Clearing Bulgaria for the second time, the Turkish border visa and insurance guys upped the prices, and we were short again! After telling them what we thought of their ethics, the decision was made that seeing Turkey wasn't critical, and we went back into Bulgaria again. Following a different road, that was slow, narrow and potholed, that wound its way over a mountain range, we arrived at Carevo on the coast. We found a hotel, and just up the road a seafood restaurant, where the food was the best ever. A bottle of wine and full bellies cost us 12 lev, about $9 aud. Continuing up the coast we road through Burgas and Ravda (again), up towards the border with Romania. It was fairly uneventful, except for a close encounter with a nut job in a Benz in Varna who cut across 2 lanes of traffic to take a call on his mobile, almost taking out a car as well. While stopped at a roadside cafe for lunch, we heard a sports bike coming from a couple of kms away, and it was screaming. As it came onto the straight near the cafe, the rider stood it up on the back wheel, and passed the two cars in front of him with the engine on the rev limiter the whole way! Very impressive, but suicidal! A straight forward border crossing into Romania further up the coast, and we booked into a hotel at Vama Veche, a small village on the coast just over the border that looked like it was a hippie hangout from the sixties. We had been talking to Terry, the guy from Coolum we met at Motocamp, and I went back to to the border and met up with him, and he joined us at the hotel.